Eskdale resonates with its past. Not just the last few centuries but over 4000 years of settlement. Some of the clues to this past are boldly evident, like the dramatic Roman fort on Hardknott Pass, while others need a little more detective work. So instead of planning another foray up Esk Pike, glorious as the prospect may be, map out a few new paths that uncover this rich heritage. Hardknott fort Everyone remarks on the natural, unspoilt landscape of the Lakeland valleys, but this is only partly true. When the first settlers arrived, from the south and Ireland, the fells were still covered with trees and the valley floors impenetrable. These early Neolithic people began to clear areas on the broad ridges of Birker Moor and Burnmoor to grow crops and for animal grazing. They were also industrious, using the sharp volcanic rocks of Scafell for their axes. Roughly fashioned heads were then taken to the coast, around Seascale, to be sharpened and honed. So, as early as 4000 years ago, there was an emerging pattern of settlements, forest tracks and a flourishing trade. The first Bronze Age settlers cleared huge swathes of the upland forests. Today you can walk, from Devoke Water, in a wide arc across Birker Moor and trip over hundreds of burial cairns and hut circles. They also built the five stone circles just above Boot, on White Moss, and a sixth at Eller How. Small they might be, but the surroundings are quite sensational and it is easy to imagine yourself transported back a few thousand years. High on the fells, overlooking Birkby, is another amazing, but largely undiscovered, landmark from these times - the City of Barnscar. Here is a long avenue of paired stones culminating in a village of over 400 cairns, hut circles and enclosures. Visit it in the spring when the bracken is low. The next arrivals in Eskdale were the Romans. In AD79, General Agricola built the first of four forts at Ravenglass as a prelude to the control of the fearsome Brigantes who occupied most of northern England. Although only the grassy embankments of the fort remain today, half of the outer bath house, known as Walls Castle, still stands. Eskdale's better known fort, Hardknott, was built some 40 years later as Emperor Hadrian consolidated defences against the marauding Scots. A great deal of the fort's walls, and the foundations of the inner buildings, survive today. Its situation, perched eyrie-like with dark crags above and below, lend an atmosphere that few ruins can match. 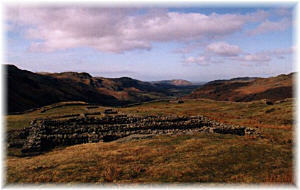 Perhaps the most surprising fact is that the Romans stayed in Eskdale until AD410, some 350 years! During the Dark Ages the valley was populated by the Celts, or Cymry, hence Cumbria, who gave us the legends of Urien and Arthur but very little else. Gradually Angles from Northumbria began to settle, and they left a legacy of the beautifully carved crosses, with their interwoven patterns, which can be seen in the churchyards of Irton, Muncaster and Waberthwaite today. The finest of these, by far, is the magnificent cross at St. Paul's Church, Irton. The most influential settlers, though, were the Norsemen in the 9th and 10th centuries. These were not the loot and pillage Vikings who swept the east coast but farmers who recognised the landscape from their homeland. It was they who created the fields and pastures that we see today. Many of the thick walls at Boot and Brotherilkeld are a result of their land clearance. Their language is also still very much alive in many of Eskdale's names, like Blea Tarn, Scafell, Birkerthwaite, Scale Gill and Dalegarth. Like the Angles, these Norse settlers left a number of carved stone crosses and tombstones. The finest Viking cross in Britain stands at Gosforth Church, its four sides combining Christian themes with pagan mythology. The famous Warrior Tomb, also at Gosforth, is said to depict the humiliating defeat of King Ethelred's army of 10,000 soldiers, at the top of Hardknott Pass, in AD1000. Unfortunately there is insufficient space to cover the following thousand years, but, hopefully, this early history will lend a different perspective to the landscape that you see today. Some of it might be shrouded by legend, but, with a little imagination, much of it still seems alive today.